The Bible defines the mission of the church as “making disciples” of Jesus Christ in all the world (Mt. 28:19-20). We believe the following five areas of commitment will be faithfully and simultaneously pursued by all who are serious about following Jesus Christ and His teachings. 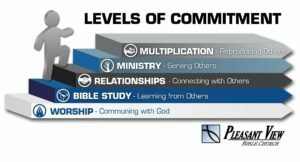 Furthermore, we believe there is a logical progression from the first level of commitment to the final one as presented in the chart below.